With the aim to reconnect old ties and forge new acquaintances among the alumni body of the UST-Education High School, on September 20, 2008, a group of around 25 EHS graduates from the different batches convened and elected its new set of Trustees for the establishment of the UST-EHS General Alumni Association, a revival of the old UST-EHS Alumni Association, which had official activity during the 1950s-1960s, from 1984-1995, then from 2002-2004. Following the Induction of elected Trustees on November 21, 2008, the association has since then embarked on a series of events anchored on the vision of gathering as many EHS alumni as possible, in preparation for two major milestones: EHS’ 60TH Year in 2010 and UST’s 400TH Year in 2011. On December 12, 2008, the EHSGAAI hosted a Multi-Batch Christmas Party at the UST-Grade School Fenced Area, gathering around 80 people to festively celebrate the Yuletide season. A month later, the Trustees, along with OAR Director Evelyn Songco & EHS Regent Fr. Romulo Rodriguez, O.P., met with no less than UST’s Rector Magnificus, Rev. Fr. Rolando V. de la Rosa, O.P., to introduce the newly formed association and discuss planned activities involving the association and the University. This meeting led way to March 19, 2009, when the Memorandum of Agreement for the UST-EHS History Project was signed by the EHSGAAI and UST officials. This is a near-two-year partnership between the two parties to be able to immortalize the history of the EHS for the past six decades. To reach out to the graduates abroad, last June 20, 2009, the association held its Website Launching. This website has since then been used by the association to trumpet announcements and showcase the activities and milestones that the EHS alumni have achieved so far. Then on August 1, 2009, exactly 59 years after the EHS opened in 1950, the association held the Walk w/ History, a campus tour that saw more than 80+ alumni brave the drizzling morning to revisit sites integral to the history of the EHS: the sites of the first and second buildings, the Main Building, the Botanical Garden, the Chapel, and the Grandstand. This activity served as the prelude to the 2009 Grand Alumni Homecoming. 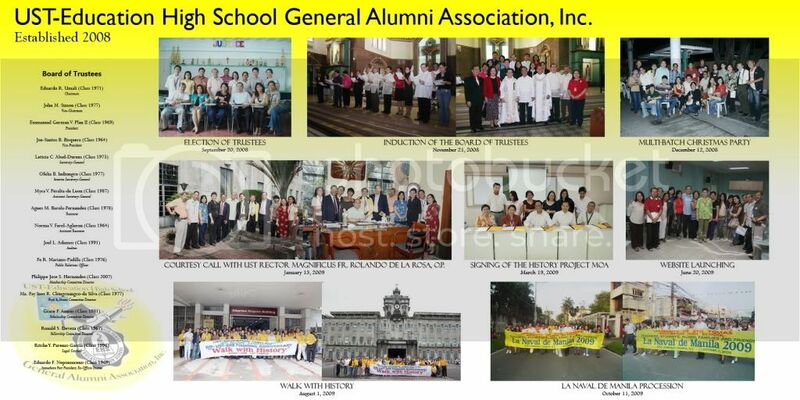 After two months of preparation, the revived UST-EHSGAAI held the much-anticipated 2009 Grand Alumni Homecoming, gathering 426 alumni representing more than 85% of all the batches of the Education High School. With a very festive atmosphere at the UST-Alfredo M. Velayo College of Accountancy, the sons & daughters of EHS came home to reunite with old friends and make new acquaintances. 36 of EHS’ brightest gems were feted with the Totus Tuus Awards, while Helen Vela of Class 1962 was given the Posthumous Totus Tuus Awards. Loyal Families and Love Couples of EHS were also awarded that day. To cap the momentous event, the Diamond Jubilee (60TH) Year Celebration of the Education High School was launched.